Republican John McCain has cut Democrat Barack Obama's nationwide lead in half, according to the latest CBS News/New York Times poll. Obama now has the support of 45 percent of registered voters, with John McCain closing in at 42 percent. The margin of error is three points. Two weeks ago, Obama's lead over McCain was 45 percent to 39 percent. About one in four of each candidate's supporters say they could change their minds before Election Day. Like the CBS News poll completed earlier this month, each candidate is backed by more than three quarters of voters in his own party, with independents closely divided, narrowly favoring McCain. McCain scores well on qualities related to experience and is seen as somewhat less likely to pander to his audience, but Obama is seen as more empathetic and is viewed as running a more positive campaign. As has been the case all summer, Obama's supporters are much more enthusiastic about their candidate than those who back McCain are about theirs. In this poll, twice as many Obama backers as McCain supporters say they are enthusiastic about their choice. About one in four McCain supporters say they are voting for him only because he is the Republican nominee or that their vote will be a vote against Obama. About half of all voters (51 percent) say they have been paying a lot of attention to the campaign this year, but that doesn't necessarily mean they are as tuned in now. Only about a third (36 percent) say they have been paying a lot of attention in the last few weeks. According to the voters, John McCain has the stronger resume by far. Two in three say he has prepared himself well enough for the job - something fewer than half of voters say about Obama. Twice as many voters say it is very likely McCain will be an effective commander-in-chief than those who say that about Obama. And McCain has a small advantage in voters' confidence that he will make the right decisions on foreign policy. But Obama has the edge in perceptions of his decision-making ability on the economy, which has been voters' biggest concern this year. 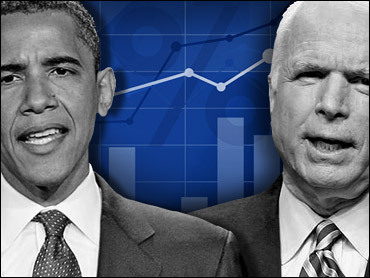 Sixty-five percent of registered voters are very or somewhat confident in Obama's ability to guide the economy, while 54 percent feel the same way about McCain. Additionally, 52 percent of voters think Obama would improve the U.S.'s image abroad, compared to 24 percent for McCain. Voters are more likely to say Obama cares about their needs and problems, an advantage Democratic candidates have historically held. Forty-five percent of voters say Obama has strong religious beliefs, while 35 percent say the same of McCain. A majority of voters say McCain is spending more time attacking Obama than explaining what he would do as president. Obama, by better than two to one, is viewed as running a positive campaign. Though controversies related to race have sparked up throughout the campaign, only eight percent of voters say McCain has brought up the issue unfairly, 12 percent say that about Obama and 11 percent say they both have done so. When asked to name something they liked about McCain, regardless of how they intend to vote, experience was at the top of voters' lists, mentioned by 14 percent. That was followed by his military service (13 percent), integrity (7 percent), and being a "straight talker" (4 percent). As for Obama, voters say they like that he will bring change (10 percent), is inspirational (9 percent), is a good speaker and a fresh face (7 percent each), has integrity (5 percent) and is young and intelligent (4 percent each). Twenty-one percent of voters offered that they liked "nothing" about each of the presumptive nominees. Even after months of campaigning, voters are unsure what either candidate will do as president. Fifty-five percent say that Obama has not made it clear what he will do as president and 51 percent say the same of McCain. When asked if the candidates have given the issue the voter cares most about enough of a priority, 61 percent say "no." This poll was conducted among a random sample of 1,012 adults nationwide, including 869 registered voters, interviewed by telephone August 15-19, 2008. Phone numbers were dialed from RDD samples of both standard land-lines and cell phones. The error due to sampling for results based on the entire sample and for registered voters could be plus or minus three percentage points. The error for subgroups is higher.